There are three key facts you need to know about the Aygo; it's cheap, it's a Toyota and it is mechanically identical to Citroen's C1 and Peugeot's 107, being built on the same production line. Actually make that four facts, as you also need to know it's a cracking little car. While many folk get embroiled in controversy about large 4x4s, it's refreshing to see that at the other end of the motoring spectrum, the city car market has never been in ruder health. With super little runabouts like the VW Lupo, Fiat Panda, Daihatsu Charade and Ford Ka already around, you'd have thought the market was saturated, but not a bit of it. So Toyota teamed up with Peugeot Citroen to develop a cheap and cheerful new platform to slot in under the Yaris, C2 and 206. The result is impressive. While it is evident that the Aygo has been built with keeping costs minimal as the main imperative, it does not feel like a poor-quality product. The cabin has some flimsy plastics and employs some obvious cost-cutting measures such as hinged rear windows, but the Aygo is likeable, feels surprisingly solid and provides a practical transport solution to anyone who needs a reliable set of wheels for minimal outlay. Toyota believes the key consumers will be youngsters attracted by the clever styling, low purchase price and group one insurance, but the Aygo's back-to-basics approach is likely to be just as appealing to more mature buyers such as pensioners and even families in need of a low-cost second car. The Aygo is at its best buzzing around city streets, where its tight turning circle, small size and 'parkability' come into their own yet will deliver up motorway miles without becoming too loud or harsh. Rear passenger space is limited and the boot is small but able to cope with a few shopping bags. Five-door models are slightly more practical and cleverly hide their extra apertures in the clean lines of the exterior design. Being part of a joint product development programme is a double-edged sword. While it means costs can be shared, it also means consumers know they have at least two other very similar cars to consider in the shapes of the C1 and 107. 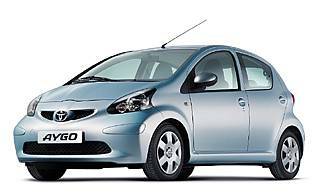 Anyone considering a purchase of any of these cars should certainly test drive the other two as well, but if the Aygo proves to be as reliable as other Toyotas, that could be enough to swing the decision. It's rare that a modern car achieves the lowest possible UK insurance rating, Group One. The Aygo does. That will be a major attraction to young buyers used to finding insurance costs prohibitive. Equally impressive is the best-in-class fuel economy of the likeable and lightweight 1.0 petrol engine, which squeezes every last drop of energy out of the fuel tank. So even if the Aygo's list prices are above its direct competitors, it could still work out as a more economic long-term option. This tiny car doesn't feel cramped but nor does it impress with the amount of space it makes available. If most of your journeys are simply about getting from A to B - and B isn't too far away from A - then it'll do the job, but don't expect to take a load of kit with you, or take passengers on long journeys without back seat mutinies. It's called a city car for a reason, after all. There are a few storage areas around the cabin, but none are particularly secure. Even the glovebox is just a plastic shelf with nothing to keep prying eyes away. Despite budget limitations, some imaginative effort has been made with the Aygo's controls. It's not all successful. Dials are clear enough but the levers used to regulate airflow could have come out of a Christmas cracker they are so brittle. Similarly the sun visors are little more than plastic-coated cardboard. The whole central console glows like a child's night light when it's dark which is certainly novel and removes the need to illuminate switches individually. Rather optimistically, Sport models come with a rev counter, which other grades lack. Front seats take up most of the available space. Despite their one-piece construction and obvious cheapness they are actually very comfortable, providing a surprising amount of support. Height adjustment is lacking and the steering wheel only adjusts for angle, not reach, so finding a comfortable driving position can be quite challenging - especially as the footwell is very narrow. Many drivers may like to consider the excellent MMT semi-automatic gearbox, which removes the need for a clutch and so gives more room for the left foot to relax in. It would be crazy to expect state-of-the-art security on this budget motor, yet the Aygo fares better than some of its rivals with remote central locking (excepting entry level), an immobiliser, major components marked with the vehicle's VIN, and security window etching linked to a 24 hour helpline. Plus the Tom Tom navigation system is portable and simply sits on the dashboard when in use. It would be nice to have at least one hidden storage area, though. Driver and passenger airbags are standard on all models, with Aygo + and Sport models gaining additional front side airbags. It is worth noting that only the two more expensive grades feature Isofix child seat mounts and detachable head restraints. However, all cars get ABS with EBD, a valuable safety enhancing system. 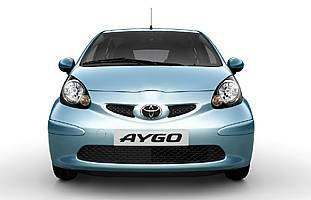 Performance figures may look pedestrian on paper but the Aygo provides an entertaining drive. The 1.0 petrol engine is more responsive than the diesel and because it is much lighter it seems to make the Aygo more nimble, too. The throttle and brake are calibrated to be idiot-proof rather than sensitive which encourages bad driving habits, but with a little thought and care, rapid progress is possible. The chassis is excellent and comes nowhere near to being troubled by the limited power outputs of the engines. Though far too small for full-scale family duties, the Aygo would work well as a 'support vehicle' second car to be used for the occasional trip to shops or to give mobility to a surly seventeen-year-old. Kids will love the cuddly looks though even they won't be particularly impressed by the cramped rear accommodation. For family use, the five-door Aygo is clearly preferable. Most first-time buyers currently invest in a used motor, but the Aygo and its kind could change that. As well as benefiting from the latest styling and the reassurance of a three-year warranty, owners will be able to take advantage of competitive dealer financing schemes that are simply not available with used cars. The Aygo's likeable nature, cute looks and practicality make it an ideal first-time buy that will still be worth something a couple of years down the line. Toyota is renowned for its attention to detail and build quality, but has traditionally been appreciated by more mature buyers rather than those looking for street cred and excitement, so the Aygo has a new task on its hands. It still seems well made despite its inevitable budgetary restrictions. Toyota plans to sell the car to a young audience, but others have done the same in the past only to discover that it's the same buyers who keep coming back - Nissan's Micra and Ford's Fusion being examples. It's likely the Aygo won't be quite as 'cool' as Toyota hopes. It's quite an achievement by the designers to create a five-door version of such a tiny car without it looking a mess. In fact, there's very little to separate the three-door and five-door models other than the latter's much improved accessibility. Nevertheless, the rear seats lack legroom and are suitable only for short trips. The boot has a very high lip - only the glass section actually moves - which makes loading heavy bags tricky and loading long objects with the rear seats down trickier still. Entry-level models of this Toyota are fairly Spartan in terms of comfort, with a folding bench rear seat instead of the 50:50 split rear seat. Aygo + adds electric front windows, detachable headrests and remote central locking, making it a worthwhile investment. Sport models have a selection of styling extras including alloy wheels and fog lamps, but underneath the car is exactly the same. External colours are limited to red as standard with optional metallic blue or silver. 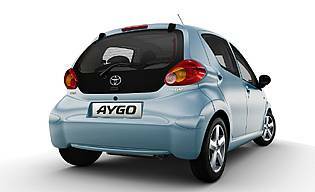 With speed-sensitive power steering provided on all Aygos, parking is straightforward. Despite the narrow rear window, judging distances aft is simple because the back of the car falls almost vertically. Front pillars aren't too thick, though the rear ones do slightly reduce visibility. But this car is nimble and has such a tight turning circle that even nervous parkers will find it easy to squeeze into tight spaces. Aygo and Aygo Plus models come with a 14-inch steel spare, while Aygo Sport has an alloy spare to match its other wheels. Available in three-door and five-door body styles and three grades: Aygo, Aygo + and Aygo Sport. 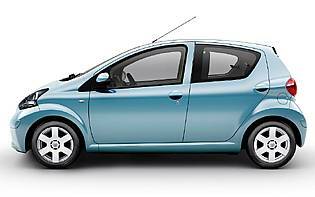 Engine range consists of 1.0 petrol (67bhp) or Peugeot Citroen-sourced 1.4 diesel (53bhp). Five-speed manual gearbox as standard with option of Multi-mode Manual Transmission (MMT), a simple and effective automatic system.